Car technology is rapidly moving forward. The latest cars will happily park themselves, report back on your driving performance, give you directions to every possible destination, and read out your SMS messages. While these options might come standard on modern cars and requiring nothing more than quickly pairing your ride to your phone using Bluetooth – those of us with older or more inexpensive vehicles will understandably feel left behind from such advancements. Fortunately, there are options out there to ensure that your 'dumb' car feels smarter than it used to. Here are a selection of ways to bring your car up-to-date. It's likely that if you have an older car, you won't want to spend much on getting the latest tech. With a little digging around under the dashboard and finding the OBD2 diagnostic port (located behind a small cover or exposed, depending on the car model), you can enjoy information on how efficiently you drive, where you've been, and even how hot your engine is running. Use a dashboard mount for your smartphone, and it'll be like having a dashboard display - sort of. The most inexpensive way of doing this is through buying an OBD2 Scanner. The diagnostic tool slots into a SCART style port, typically located below the steering wheel, and doesn't require anything overly invasive. A Bluetooth-connected device is easily purchased for $16.99 (about £11.27, AU$23.31). Multiple apps can tap into the resulting data, but the best option is to use Dash. It's a free app for iPhones and Android, and it'll track everything you can think of before scoring you on how economically you've been driving. Worried that you're braking too hard or too frequently? The app will soon put you straight. It'll also read and decode error codes, giving you more details than just your regular "Check engine" light. Further options include Automatic at $99 (about £65, AU$135) or Verizon's Hum for $14.99/ month (about £9.95, AU$20). These work in similar ways but cost more than Dash. Both services add on the ability to locate your parked car at all times, while Automatic includes a Do Not Disturb mode for Android users. More importantly, both devices can detect severe collisions and alert emergency services to your plight immediately. Potentially, this could be a lifesaver. Diagnostics are a great novelty for many, but most drivers are going to be more interested in playing music through their phone's library or using their phone hands-free while they drive. If your car stereo has an AUX in port, this is easily solved. Buy the TaoTronics Bluetooth receiver for $15.99 (about £10.62, AU$21.96) and slot it in. 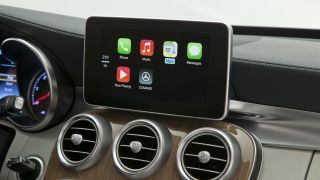 You can quickly enjoy playing your music through the car's speakers, as well as use it for hands-free calling. For iPhone owners, Siri voice commands will also work through it. Don't have an AUX in port on your car stereo? There are still options, via GOgroove FlexSMART X2 or Motorola's Roadster 2 Tz710 Bluetooth speakerphone. GOgroove FlexSMART X2 is the cheaper option priced at $29.99 (about £19, AU$41). It'll work with any Bluetooth enabled phone or tablet and plugs into your car's cigarette lighter. Pair it up with your phone and the FlexSMART X2 modulates an FM signal to send audio to your FM radio. It's not the neatest of solutions, but it's fairly simple to set up. The X2 has a built-in microphone with voice detection ensuring that calls can be made hands-free and safely. It won't recognize voice commands when controlling music though, requiring you to resort to buttons on the device. A more compact solution, the Motorola Roadster 2 Tz710 Bluetooth speakerphone ($69.99, about £46, AU$96) offers all the features of the FlexSMART X2, plus it'll read your SMS messages to you. It clips onto the sun visor in your car and wirelessly hooks up to the car speakers through a FM radio transmission. When a call comes in, it'll announce the contact name or number, and you can simply say "answer" or "ignore" in response. Where it stands out is its ability to read incoming SMS messages, and allowing you to dictate any replies without having to press a button. You just respond "yes" or "no" when an alert comes in, so the device knows whether to start dictating. Tying into Siri or Google Now, it also offers other voice commands. Sat navs have revolutionized finding your way around the world. On the flip side, these units are occasionally distracting and were once too reliant upon tapping on buttons on the screen. But with newer-gen sat navs, that's no longer an issue. For an inexpensive voice-controlled unit, the TomTom GO 50 is an excellent choice. Priced at $128.99 (about £85, AU$177), it offers the comforts we've come to expect from TomTom as well as voice recognition. It still requires you to hook it up to your smartphone though, in order to take advantage of your data plan. For those looking for a more state-of-the-art solution, the Garmin NuviCam LMT-D offers excellent voice recognition as well as a dash-cam. However, it comes at a premium price of $349.99 (about £232, AU$480). The most inexpensive option is to use Waze - a community-based traffic and navigation smartphone app - that, among other things, offers voice-based navigation. Entirely free, it's not as stylish as the likes of TomTom or Garmin, but it will save you from storing yet another gadget in your car. If money and conducting some DIY work aren't issues for you, then the best option for making your car smarter is still to install a new head unit yourself. One great option is the JOYING Head Unit. Priced at $259 (about £172, AU$356), it runs off Android Kitkat, providing Android phone mirroring as well as iOS' Airplay. You can use it to play any music you throw at it, as well as enjoy the navigation features. Passengers can also watch YouTube, Netflix and more through it. If you prefer the idea of a known brand with these same features, then the Sony XAV602BT Bluetooth Car Video Receiver has it all. It's not cheap at $536 (about £355, AU$736), but it's a stylish solution with video content playback, navigation features and a high-quality radio. Want to go crazy with money and happen to own an Audi A4 or S4? For $10,000 (about £6,638, AU$13,734), you can enjoy a driverless experience through the Cruise RP-1 system. The technology uses sensors and actuators to control steering and driving, so you don't have to. While the price tag is prohibitive to many, it's the ultimate way of making your "dumb" car smarter.